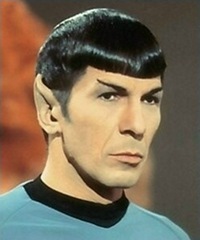 The new people search engine, Spock, launched today to the world! Spock already had over 100 million people in its database. Sounds simple, like another Google clone, but think again! Spock is purely about people search. While wink, LinkedIn, and ZoomInfo.com have been around for a while now, Spoke's approach is to use meta tagging, in combination with a wiki like interface. The result is extremely accurate searches, with a lot of pertinent information on the people you are searching for. Try a search for someone in Google, and you get everything for someone's name, a lot of things which are useless. Search on Spock, and you get extremely specific information about the person you are researching. Instead of just searching information that is crawled, Spock is smart, and try's to "read" the document for information, and stores the information. It's actually a really cool system! Check out Spock today during your lunch hour or break! While you're there, make sure to upload your picture and set up a profile if Spock hasn't found you yet! Also, please leave your comments behind on how you liked this new service! As a software engineer and software architect myself, I find myself constantly trying to find new information on the Internet on best practices, patterns, tools, etc. I recently started using other social bookmarking tools, but became irritated at the growing number of stories that I felt made no sense, being ranked extremely high. Certain features such as previewing the page, showing number of clicks vs. the number of votes, displaying "complaints" live for a vote seemed missing (some sites have this, but have a proprietary system that is undisclosed to serve as the banning mechanism for entire domains, which is scary if we are trusting these companies to make news "free" and selected "by the people). dzone is a great example of social bookmarking done right! A really nice feature I love is the ability to see a Ajax preview window pop up on each story that is being voted on. Also, with each story you have the ability to "tag" stories with keywords, similar to tags on blog's. This gives users the ability to view upcoming links based on tags! As an example, someone submitting a story can tag the story with certain keywords, and a voter can then add their own tags to the story. This gives stories that might not have been tagged properly, or missing certain tags, to be "re-classified" under another section. Another great feature is the "You might also like" feature. This lists stories that the user might like, if they liked the current story they are looking at. Also a "Real Time Spy" allows you to view what users are doing in real time. This can be anything from stories that are currently being voted on, to what users are clicking, or even commenting on. The filters are very nice! I also love that the dzone is tailored to developers. All of the links are very pertinent to software developers, and the community here has really formed around them. If you are a software developer, you will absolutely love this site, as it has more functionality than any other social bookmarking site out there. I hope to see a new version of the site tailored around technology, and then maybe expanding into other areas. The overall architecture of this site just seems so much more flexible and responsive, vs other sites. PopUrls.com has recently noticed dzone as well and added them to their list of social bookmarking web sites to display. Ever wonder what people are searching on the internet. Here is a neat little web site that will show you what people are searching! We are currently looking at replacing one of our oldest and lest cared about system, our phone system. The company has never really looked at this technology much because it always seems to reliably work. On this quest, we bumpted into some free solutions that we ae investigating further. Now I'm sure by now you have heard that VMWARE is free to use now. Because of this, we have decided to format a few of our older rack mount servers (Yes we are now on a blade/san system that ROCKS! ), load up linux, and install a few VMWARE servers on it. So far its our testing environment, has 8GB of Ram, and works great! We have even installed HP Procurve Manager on Linux.. its sweetness. Ok, so maybe there were some more free things we could use... maybe load up a Linux VMWare image... with some free Linux Software.... Well, check this out! Classifieds site owned by eBay. Have a favorite movie? Band? Artist? Director? You can type it in, and this tool will find similar things for you that you might like. An amazing Web 2.0 application. Your new bartender!